The War Memorial from Bryn Chapel in Sandiway was moved to Gorstage Cemetery. A service of commemoration was held at St Johns Church, Sandiway on the 11th September 2016. 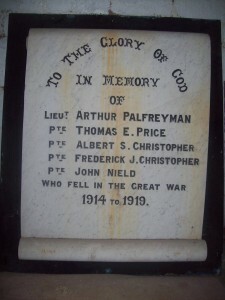 Two of the men, Thomas E. Price and John Nield, are also on the Weaverham War Memorial. Thomas Price was in the 2/9 Manchester regiment and died on the 9th October 1917. John Nield was in the 12th Cheshire regiment and died on the 18th of September 1918. Frederick J. Christopher and Albert S. Christopher were cousins. Frederick Christopher was in the 8th Cheshire regiment and died on the 1st of September 1915. Albert Christopher died on the 5th of September on the Somme.